Drunk Elephant’s Marula Oil is a luxury 100% virgin marula oil formulated for all skin types (including sensitive and acne prone) that deeply moisturizes your skin while helping to restore a youthful glow and fully rejuvenates the face. We’re all struggling to pick from all of the available oils on the market with so many available options, and marula oil has become a trendy “hot button” ingredient lately that everyone seems to be talking about. So it is no surprise to see why Drunk Elephant’s Marula Luxury Facial Oil has become such a favorite and is not only totally pure and organic, but leaves the skin as healthy, dewy, fresh, and radiant and possible. We’re all in search of a completely natural remedy to get rid of fine lines, wrinkles, sun damage, and enhance the appearance of our skin. So is Drunk Elephant’s Marula Oil the solution to younger looking skin and deep hydration when you’re dry? We reviewed to test the hype. 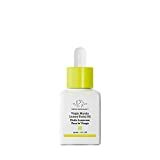 Drunk Elephant’s Marula Oil is a 1oz luxury facial oil packed with antioxidants to support skin health, maintain a youthful glow, and support anti-aging benefits. The marula oil is derived straight from the actual marula fruit and is completely organic, yet the oil works to deliver actual results and helps your skin look younger and feel incredibly softer. I noticed after a few weeks needing less of other products, like serums and creams (while only needing a small amount of the oil, which goes quite a long way), as well as a visible decrease in the appearance of lines around the forehead. And with Drunk Elephant’s Marula Oil, my skin just continued to glow and look vibrant and healthy. I noticed receiving compliments asking if I had done anything differently in general, and even comments from more than one person on the appearance of my skin (which was dry, dull, and lifeless before using it). So while it was a splurge, it was not something I regretted, and is definitely something I would recommended when you’re in need of a quick boost of radiance, hydration, and looking for a softer, healthier, and dewy appearance quickly. If you have dry skin, this is also a great way to moisturize your entire face and save on product, because it really goes the distance, and saves on the need for using a lot of other facial products. With that said, a lot of customers with oily and combination skin also enjoy this product, because it is lightweight and helps restore PH balance, and never feels greasy or heavy on your skin. We’re all searching for that perfect oil with so many options to pick from, and while it may come down to a personal preference, Drunk Elephant’s Luxury Facial Oil truly has most of the competition beat by far. If you are dissatisfied with the use of Drunk Elephant’s Virgin Marula Luxury Facial Oil, or if it does not work for your skin to provide suitable skincare, anti-aging and general hydrating benefits, or you experience any product allergy or reaction to the formulation, you may elect to return it at any time. In this case, the formulation of the Marula Oil was quite gentle enough to use even with very sensitive and acne-prone skin and did not cause any irritation or breakouts, and it is designed to be safe/gentle for all types of skin, but spot testing is definitely recommended with this product, as with any topical treatment item. Drunk Elephant Marula Oil: Worth It Winner? While there are so many different oils to pick from on the market, Drunk Elephant’s Marula Oil, while not cheap, is truly worth it for its price. After only a few days of use, my skin was glowing and I did not even feel the need for additional serums, creams or treatments. Even with very dry skin that was feeling dull and flaky from harsh winter weather, the Drunk Elephant Luxury Facial Oil made my skin look healthier and it was truly “glowing” and dewy in a way it hadn’t in months. It also required a very small amount of product to treat the entire face and neck area, and was perfect to use at night as a luxury treatment before bed, as well as in the morning before makeup for a more radiant and even finish. While it is a splurge, this is one of the few rare products I have found that is completely natural that truly provides anti-aging benefits that are visible to you and others, who start asking if you’ve changed your hair or done something different (you can let them in on the miracle oil or keep your secret). Either way, this has become my favorite oil skincare product I have tried for hydration, radiance, and anti-aging in one, and would highly recommend it as a treat when you’re in need of a boost.